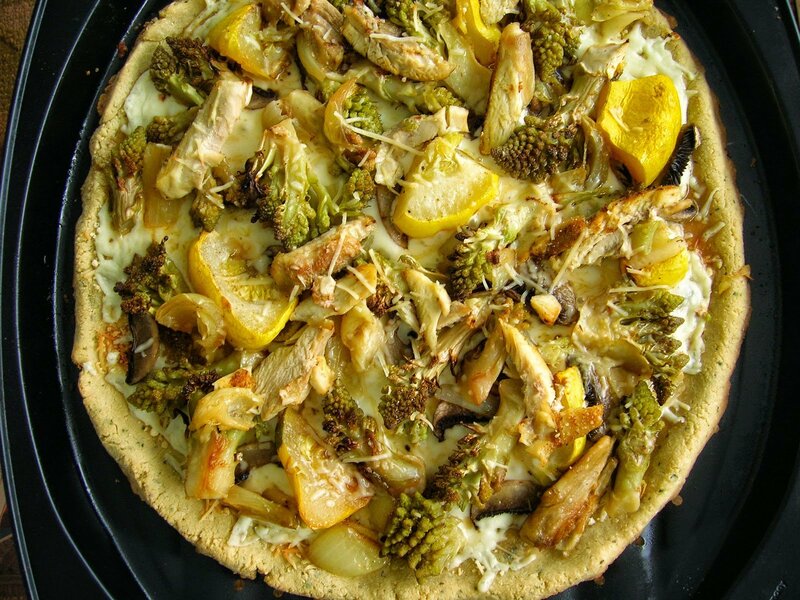 Our awesome little guest blogger, Skinny GF Chef, came up with this great recipe for pizza. Mix and match your toppings and you could use this for any organic veggies you have on hand. Toppings can be whatever you desire. I chopped up and roasted Mini Yellow Squashes and a head of Romanesco Cauliflower that was in my box from Space Girl Organics with five cloves of garlic, one whole chopped onion and a pound of boneless skinless chicken thighs. Mix it all with a little olive oil, salt and pepper and roast in a single layer at 350 degrees F. until tender. It was heaven! In a large bowl, whisk together the Almond meal flour, Coconut flour, baking powder, and the Italian spices, set aside. Note: do not add the tapioca starch/flour or sweet rice flour yet, depending on which you are using. In another smaller bowl, whisk the olive oil,warm water, mashed garlic, apple cider vinegar and sea salt. Add 1/4 cup of the tapioca starch/flour or sweet rice flour and mix. The dough will still be somewhat sticky. Knead dough in the bowl sprinkling the remaining flour on the ball and working in until dough is manageable. You don’t want it too dry or your crust will be hard. Flour your board and rolling pin and roll out to apx 1/4 inch thick and lay in greased pan. Form a raised crust on the edges with your fingers. Or you can put the dough in the middle of your pan and press out evenly with your fingers. Add sauce of choice. My favorite is 1/4 cup olive oil mixed with 3 mashed roasted cloves of garlic. Add shredded mozzarella and toppings. Sprinkle with a little more Parmesan.